Kefir is a cultured milk beverage, the result of microbial action of a wide community of micro-organisms present in kefir grains on milk. The micro-organism (bacteria and yeast cells) are located on the surface of the grains as shown in the row above and are also lodged in the grains which are composed of a polysaccharide matrix of "kefiran" (image at left). The micro-organisms metabolize lactose present in the milk and produce lactic acid which coagulates the milk and forms a beverage called kefir. It has a uniform creamy consistency and is slightly acidic mostly from lactic acid. Some effervescence is caused by carbon dioxide and a minute (<2%) concentration of alcohol due to the action of yeast cells also present in the grains. In addition, the micro-organisms produce the poly­sac­charide kefiran which increases the dimensions of the grains. New grains form from fragments of larger grains. The kefir beverage contains a variety of aromatic substances which give it a characteristic flavour. Micro-organisms present in the grains are called probiotic because they are beneficial to human health. There are lactobacilli, such as L. brevis, L. cellobiosus, L. acidophilus, L. casei, L. helveticus, L. delbrueckii, L. lactis, etc., lactococci, such as different subspecies of Lc. lactis, Streptococcus salivarius ssp. 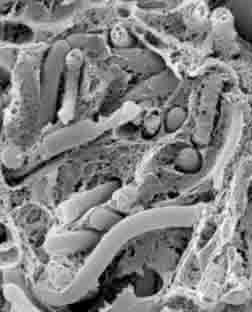 thermophilus, Leuconostoc mesenteroides and L. cremoris and a variety of yeasts (fungi), such as Kluyveromyces, Candida, Torulopsis, and Saccharomyces sp. (Micrographs of some of these microorganisms may be accessed here). Many people accept the fact that kefir may only be made using kefir grains but some others would prefer to make it when they want it rather than continually as the grains "dictate". Freeze-dried "starter cultures" for one use are available, for example from this source. There are many aspects of kefir featured on the Internet, from the origin of kefir in the Caucasus mountains, what it is, to information on how to make kefir at home and other aspects, including science and such scientific questions aas to whether the quality of kefir is affected by rinsing the kefir grains with water. For information on microscopy, please contact the author.